I've written about the pair of Greenspire Linden trees that we have in our backyard that I espalier'd in the late Summer of 2017, right after we moved in a few times here on the blog - with the most recent being in May of last year where I showed the tree's buds about to burst open to life. 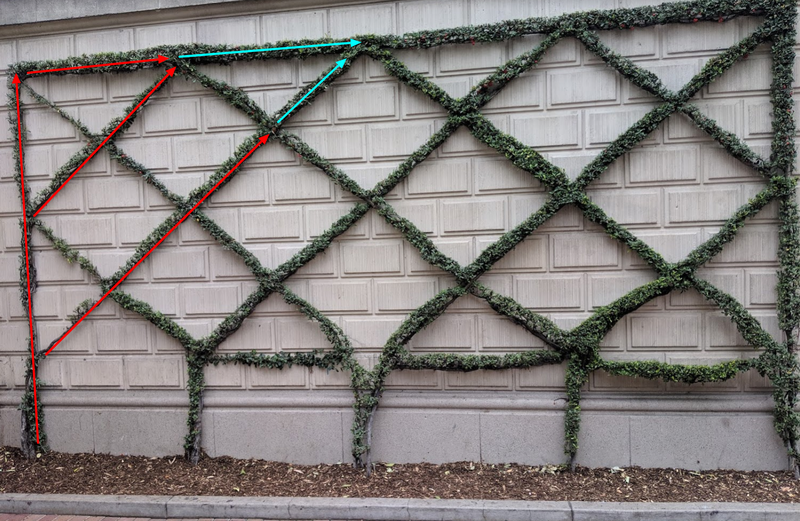 Here's a post from September of 2017 that I showed the espalier system that I used (wires and posts) and why I chose to put them a little bit further away from the fence than one would normally. Those two espalier'd trees are done in what is known as the "cordon" style. Or, maybe, a "Double Cordon" or "Triple Cordon" because we have (currently) four rows of branches. Cordon is just one of the styles that are popular with the others being Candelabra and something called the "Belgian Fence". 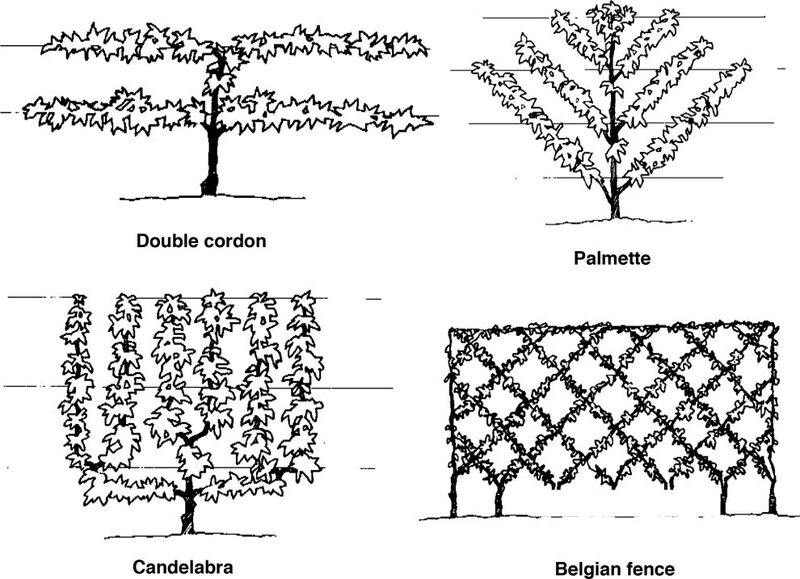 Here's a breakdown of some of the most common versions of espalier from "State by State Gardening" below. Link to the image here. Via State-by-State Gardening here. This is *their* image, not mine. 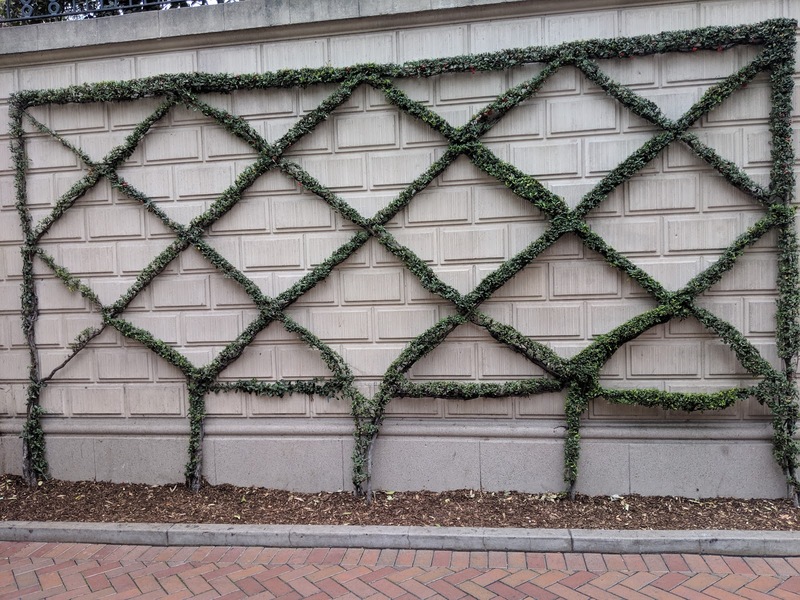 The Belgian Fence style is the one that I wanted to talk about here, because you can see in the photo at the top of this post, it is the style that I came across at Disneyland Park in Anaheim. This was done up on a building that is terraced close to It's a Small World in the back of the park and is done to kind of mask a large, blank wall. The other versions in the image above are interesting, but I think that you can likely agree that the standout is the Belgian Fence, right? The Belgian Fence you see here is pretty awesome, isn't it? By my count, it is made from five individual trees (or in this case are these shrubs? The reason I ask is that they're leaf'd out all the way down to the ground??) and it is trained to have all the trees overlap each other. Seeing this in real life sparked a conversation with Natalie and I about how I thought we could do a Belgian Fence along the Southside of our house - where we have a pretty large blank sided wall. It is right where I planted the two new Disneyland Roses that we were given from Nat's Mom for our Anniversary this year. But, what variety? Other ornamental plants such as magnolia (Magnolia grandiflora ‘Little Gem’), rose of Sharon (Hibiscus syriacus), and weeping Yaupon holly (Ilex vomitoria) can also be espaliered. So, first decision is fruit or no fruit. Then, if no fruit, what will grow fast and strong. In our first house in Elmhurst, we had some Rose of Sharon - and they grew fast and wild. Little ones sprung up all the time and they quickly were able to be cultivated into something more substantial. I'm not sure that's something I want to deal with, but the fast-nature growing is certainly appealing. We had a fruit tree in our old house in Elmhurst, too. It was a pear tree. And it suffered some storm damage early in its life. And then, after a little bit of pruning, totally took off. In four(ish) years, it went from a .5" caliper tree to a big, thick 5-6" caliper tree that was healthy and strong. A quick look around at the usual sources turns up this post from Detroit's Deborah Silver where she shows off a really beautiful (and promising) Belgian Fence made up of Golden Galaxy Crabapple trees. Those Golden Galaxy trees are hardy down to Zone 4, so going with a crabapple might make sense, too? With Spring already on my mind, I think we have to decide if we want fruit or no fruit relatively quickly and then begin to narrow in on securing the small trees so we can count this season's growing season for them.